At the invitation of a very kind man named David Mulvaney, I joined a group of volunteers to prepare food for San Diegans who do not have enough food to eat. 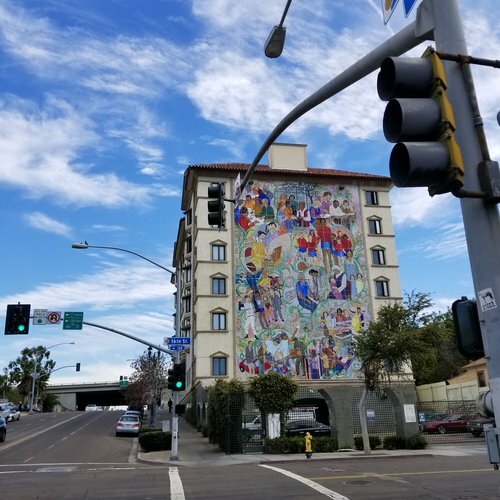 We met at Father Joe’s Villages in San Diego, which is at 15th and Imperial, not too far from a major transit stop and across from the Metropolitan Transit System bus yard. I had been down there before, most recently on two tours of the property by the CEO Deacon Jim Vargas while I was deepening my understanding before releasing our Hope4Homeless plan (link below). Deacon Jim is the kind of compassionate, driven person necessary for this work, as the people in need have a range of very severe issues and the politics of truly helping can get messy. I walked up the main courtyard and saw dozens of people. The men and women I saw were someone’s brother or sister or mother or father…and they were all struggling to make it. One good reason to spend time here is that it is an important reminder that the “homeless crisis” is about actual, flesh and blood human beings living in often awful conditions and in desperate need. It is a direct, specific reminder of the human difficulties involved – the disability, the varied hygiene, the mental health struggles…and the hunger. We were assigned to the kitchen to help prep 900 hamburger patties from big tubs of seasoned raw meat. Four of us were ‘team hamburger’ and with the help of the chef we quickly formed an assembly line to push through our task. As the four of us stood and scooped and patted and shaped hamburger, we talked about our lives. I talked about running for the County Board of Supervisors and the elements of our Hope4Homeless plan, and about my biological mother’s own struggle with mental illness and homelessness. More importantly, I listened to the three men volunteering with me from three very different life circumstances share about their companies, their life journeys, and their commitment to making a difference. In the end, as I left and reflected on my own experience I felt the anger well up inside me. I think when we allow ourselves to face homelessness and hunger up close it can light a more consistent fire to drive change. What we are doing now as a community is unacceptable and you can really feel how intolerable it is when standing among hundreds of hungry people who are trying to survive. I am grateful to have the opportunity to serve them, grateful to have volunteered with a few very decent people, and also grateful for the very direct reminder of why I wake up every morning fighting to represent the 4th Supervisor’s District. It is not to hold down some political post or build some stepping stone to the future. It is about fundamentally changing our system in this community to improve the lives – and opportunities – of the people across San Diego County. You can read our whole Hope4Homeless plan here.